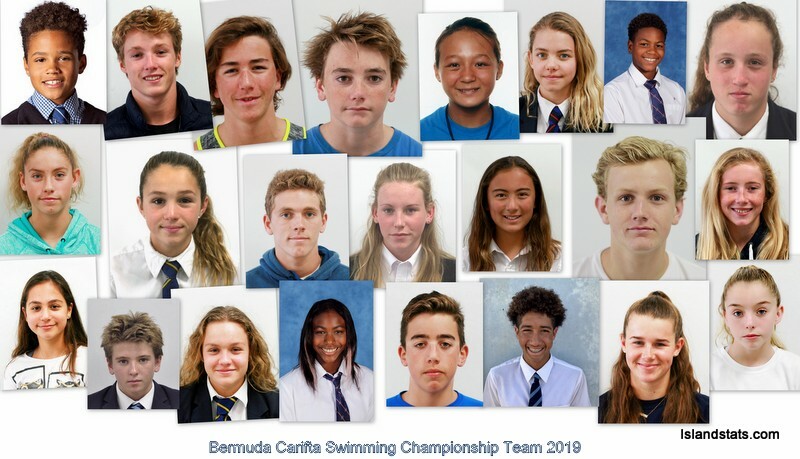 Bermuda swimmers concluded competing in the Carifta Swimming Championships in Barbados, on the Final Day of the Championships, Bermuda picked up another 13 Medals to make their Final Count 42. The Bermuda team would finish a remarkable 2nd overall, with 13 Gold, 17 Silver and 12 Bronze Medals. Elan Daley won the 13 – 14 Girls Age Group Individual High Points, while Sam Williamson was the 13 – 14 Boys Age Group Individual High Points winner. Taylor White won the 13 – 14 Girls 400 LC Meters Freestyle Bronze Medal. White won the 13-14 Girls 200 LC Meters Backstroke Silver Medal. Logan Watson-Brown won the 15-17 Girls 400 LC Meters Freestyle Silver Medal. Watson-Brown claimed the 15-17 Girls 200 LC Meters Backstroke Bronze Medal. Brian Desmond won the 15-17 Boys 400 LC Meters Freestyle Gold Medal. Elan Daley won the Silver Medal while competing in the 13-14 Girls 100 LC Meters Breaststroke. Daley would also win the 13-14 Girls 200 LC Meters Backstroke Gold Medal. The 11-12 Girls 100 LC Meters Breaststroke Silver Medal went to Giada Dudley-Pun. Sam Williamson picked up the Gold Medal during the 13-14 Boys 100 LC Meters Breaststroke. Imojen Judd won the 11-12 Girls 200 LC Meters Backstroke Bronze Medal. Jack Harvey won the 15-17 Boys 200 LC Meters Backstroke Silver Medal, while Brett Smith won the 15-17 Boys 200 LC Meters Backstroke Bronze Medal. The 11-12 Girls 4x50 LC Meters Freestyle Relay team of Imojen Judd, Bella Howes, Pippa Charleson and Giada Dudley-Pun won the Bronze Medal. Bermuda swimmers were back in action in the Carifta Swimming Championships going on in Barbados. The Championships are into Day Three, with Bermuda winning another 11 Medals to take their count to 29. Elan Daley has captured yet another Gold Medal, this time during the 13-14 Girls 200 LC Meters IM. Daley would then win the 13-14 Girls 100 LC Meters Freestyle Silver Medal. Giada Dudley-Pun won the 11-12 Girls 200 LC Meters IM Silver Medal, while Imojen Judd won the 11-12 Girls 200 LC Meters IM Bronze Medal. Sam Williamson won the Silver Medal while competing in the 13-14 Boys 200 LC Meters IM. During the 13-14 Boys 100 LC Meters Freestyle Williamson would capture the Bronze Medal. Williamson would make it 3 on the Day when he won the 13-14 Boys 100 LC Meters Breaststroke Silver Medal. Elijah Daley joined in on the Medal party when he won the Gold during the 11-12 Boys 200 LC Meters Butterfly. Daley would also capture the Silver Medal in the 11-12 Boys 200 LC Meters IM. The 11-12 Mixed 100 LC Meters Freestyle Relay team of Bella Howes, Brandon Adkins, Elijah Daley and Giada Dudley-Pun won the Silver Medal. The 13-14 Girls 4x200 LC Meters Freestyle Relay team of Emma Kittleson, Josephine Duerden, Elan Daley and Taylor White won the Bronze Medal. Bermuda swimmers were back in action in the Carifta Swimming Championships going on in Barbados. At the conclusion of Day Two Bermuda increased the Medal Count to 18 after picking up 10 more Medals. On Day Two Bermuda picked up 4 Gold, 3 Silver and 3 Bronze Medals. 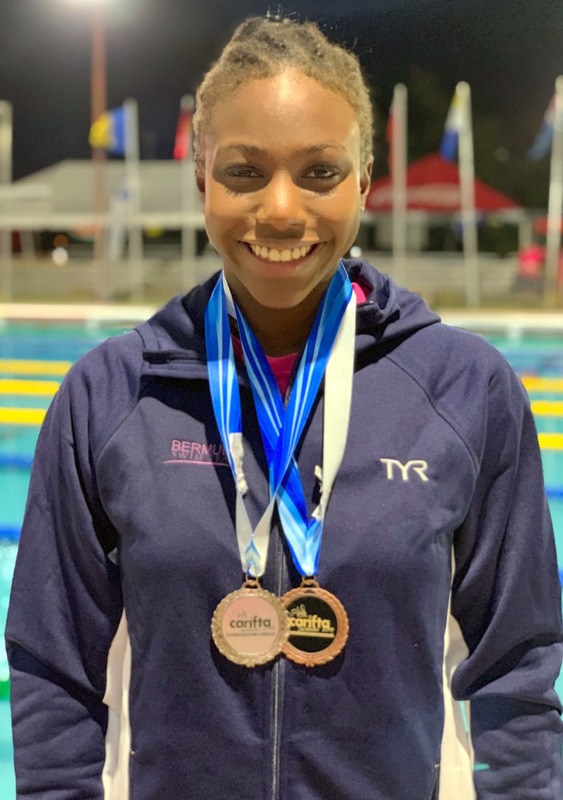 Elan Daley picked up the Gold Medal in the 13-14 Girls 200 LC Meters Freestyle Final, and in doing so she set a new Bermuda Record as well as a New Carifta Record time of 2.06:13, smashing the time she had produced earlier in the day. Daley would then capture the 13-14 Girls 100 LC Meters backstroke Gold Medal. Logan Watson-Brown won the 15-17 Girls 200 LC Meters Freestyle Gold Medal with a time of 2:07.86. It was also Gold for Giada Dudley-Pun in the 11-12 Girls 400 LC Meters IM touching the wall in a time of 5:38.82. The Bermuda 11-12 Girls 4x100 LC Meters Medley Relay team of Imojen Judd, Giada Dudley-Pun, Pippa Charleson and Bella Howes won the Silver Medal. Sam Williamson won the Silver Medal during the 13-14 Boys 200 LC Meters Freestyle. Williamson would also win the Silver Medal while competing in the 13-14 Boys 400 LC Meters IM. Imojen Judd also captured a Bronze Medal when she finished third in the 11-12 Girls 100 LC Meters Backstroke. Elan Daley would capture a Bronze Medal in the 13-14 Girls 50 LC Meters Butterfly. Elijah Daley won the 11-12 Boys 100 LC Meters Backstroke Bronze Medal. Pippa Charleson finishes 5th in the 11-12 Girls 50 LC Meters Butterfly touching the wall in a time of 31.70. Brian Desmond touched the wall in a time of 2:00.24 to finish 6th in the 15-17 Boys 200 LC Meters Freestyle. Daria Desmond finished 4th in the 11-12 Girls 400 LC Meters IM clocking a time of 5:55.31. The XXXIV Carifta Swimming Championships 2019 got underway in Barbados. A total of 8 medals were won on the opening day that included 4 Gold, 3 Silver and a Bronze. 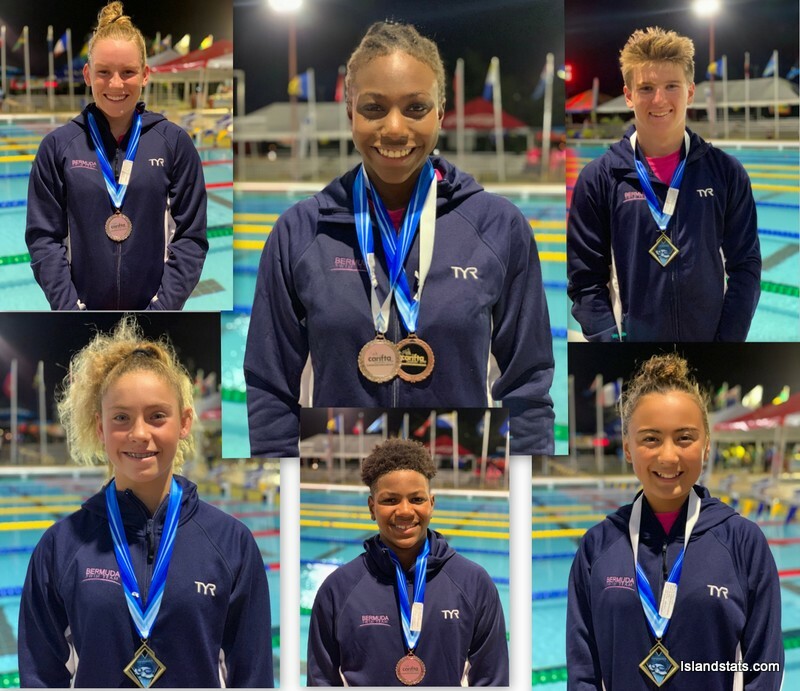 Bermuda's first Medal was a Gold from Giada Dudley-Pun in the 11-12 Girls 200 LC Meter Breaststroke, Imojen Judd also won a Gold Medal when she touched the wall first during the 11-12 Girls 20 LC Meters Backstroke. 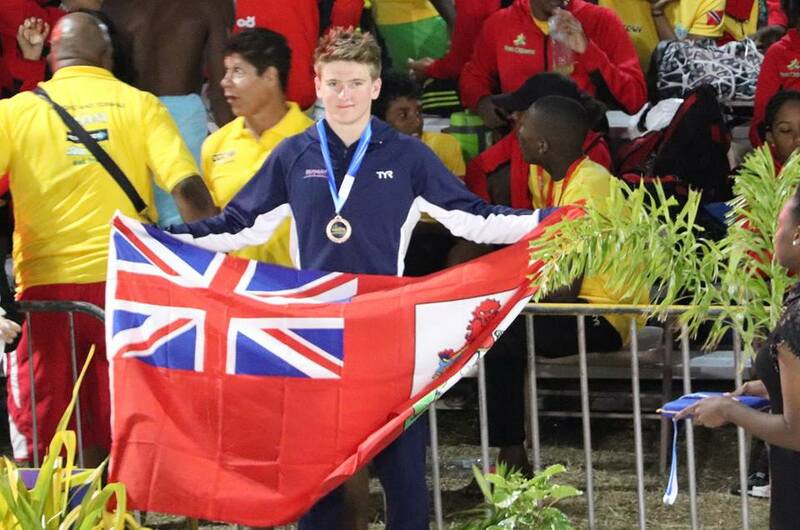 Sam Williamson picked up Bermuda’s 3rd Gold Medal of the day when he won the 13-14 Boy’s LC 200 Meters Breaststroke, with the final Gold Medal performance coming during the 11-12 Girls 4x100 LC Meters Freestyle Relay, with Pippa Charleson, Bella Howes, Imojen Judd and Giada Dudley-Pun. Logan Watson-Brown won the Silver Medal competing in the 15-17 Girls 100 LC Meters Butterfly, while Elijah Daley won the Silver Medal in the 11-12 Boy’s 100 LC Meters Butterfly. Elan Daley captured a Silver Medal for finishing second in the 13-14 Girls 50 LC Meters Backstroke, she would also win a Bronze Medal during the 13-14 Girls 200 LC Meters Breaststroke. Taylor White finished second in the 13-14 Girls 800 LC Meter Freestyle when she was clocked at 9:53.25. Giada Dudley-Pun clocked the fastest 11-12 Girls	200 LC Meter Breaststroke Preliminary time of 2:54.69, Daria Desmond also advanced to the Final finishing 5th clocking 3:04.76. Elijah Daley and Rhys Insley both advanced to the 11-12 Boys 200 LC Meter Breaststroke Finals, Daley had the 4th fastest Preliminary time of 2:54.36 and Insley was 5th clocking 2:55.50. Elan Daley advanced to the 13-14 Girls 200 LC Meter Breaststroke Final when she was clocked at 2:57.21, while Josephine Duerden was 6th in a time of 2:57.21. During the 13-14 Boys 200 LC Meter Breaststroke Preliminaries, Sam Williamson clocked the fastest time of 2:32.47. Imojen Judd’s time of 32.67 saw her clock the fastest 11-12 Girls	50 LC Meter Backstroke Preliminary time, while Bella Howes finished 10th clocking 35.76. In the 11-12 Boys 50 LC Meter Backstroke Preliminaries, Elijah Daley advanced to the final with the 5th fastest time of 32.23, while Brandon Adkins finished 13th clocking 33.89. Elan Daley clocked a time of 31.72 on her way to recording the fastest Preliminary time during the 13-14 Girls 50	LC Meter Backstroke, while Emma Kittleson finished 16th clocking 34.07. Logan Watson-Brown advanced to the 15-17 Girls 50 LC Meter Backstroke Final when she finished 5th during the Preliminaries clocking 30.74, Gabriela Pitman finished 14th with a time of 34.21. Two Bermuda 13-14 Boys 50 LC Meter Backstroke swimmers advanced to the Final, Finn Moseley was 5th in the Preliminaries with a time of 29.33, while Sam Williamson finished 7th clocking 30.07. Brett Smith finished 6th in the 15-17 Boys 50 LC Meter Backstroke Preliminaries when he touched the wall in a time of 28.60, while Jack Harvey was 7th with a time of 28.95. During the 11-12 Girls 100 LC Meter Butterfly Preliminaries Pippa Charleson was 7th with a time of 1:14.21 and Imojen Judd was 9th stopping the clock in a time of 1:14.75. Elijah Daley advanced to the 11-12 Boys 100	LC Meter Butterfly Final after recording a Preliminary time of 1:05.90, while Brandon Adkins finished 13th with a time of 1:11.6. During the 13-14 Girls 100 LC Meter Butterfly, Elan Daley finished 4th with a time of 1:07.54, while Taylor White was 9th with a time of 1:09.68. Logan Watson-Brown clocked time of 1:06.23 on her way to advancing to the 15-17 Girls 100 LC Meter Butterfly Final when she finished 2nd 1:06.23. During the 15-17 Boys 100 LC Meter Butterfly Preliminaries Zebedee Wakely was 12th with a time of 1:00.36 and Caleb Ingham was 15th clocking 1:02.16. 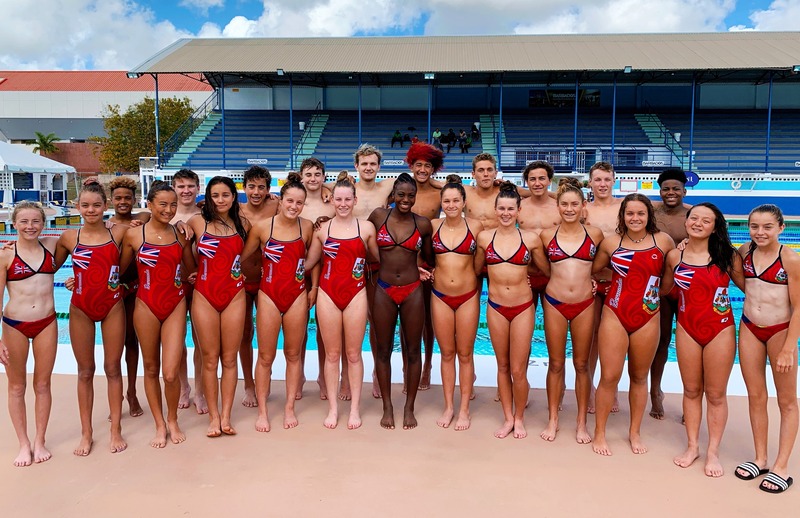 The Bermuda Carifta Swimming Championship team was announced recently and today www.islandstats.com brings you those athletes who are currently on island. The Carifta Championships is an annual, Age-Group Aquatics Championships for the Caribbean. It has been held since 1985, and is similar in form/origin to the Track & Field/Athletics event, the CARIFTA Games. The event is held under the auspices of CANOC, the Caribbean Association of National Olympic Committees.